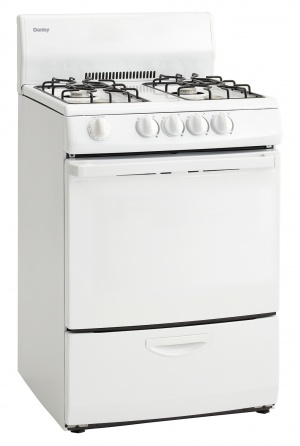 Good things often come in small packages such as this space-saving compact gas range by Danby. This top-class model, which is just 24 inches in width, can operate on either natural gas or liquid propane, making it a perfect addition to smaller kitchens and remote locations. The range comes with four open burners featuring 9,100-BTU’s of power and one 13,000 BTU oven burner. Starting and controlling the elements is simple due to the smart electronic-ignition function and push-and-turn safety knobs. There’s plenty of room for your favorite dishes in the 3 cubic foot oven which comes with a broiler drawer, elegant window, bright interior light and pair of sturdy racks. There’s also an integrated lip to contain any spillage. The surface is constructed with scratch-resistant porcelain and a large backsplash which makes it easy to clean. This superb gas range also offers 12 months of coverage on parts and labor with handy in-home service. Why can’t I have my unit in an outside kitchen or in an RV? Why does this void my warranty? Our ranges are not designed for outside installation. This also includes anywhere that is not temperature controlled. ie. garages, porches, carports, etc. What is the retail price of this unit? This varies based on where you purchase a Danby unit. It may be helpful to look at various retailers in your area to compare models and pricing. Please refer to the energy guide.